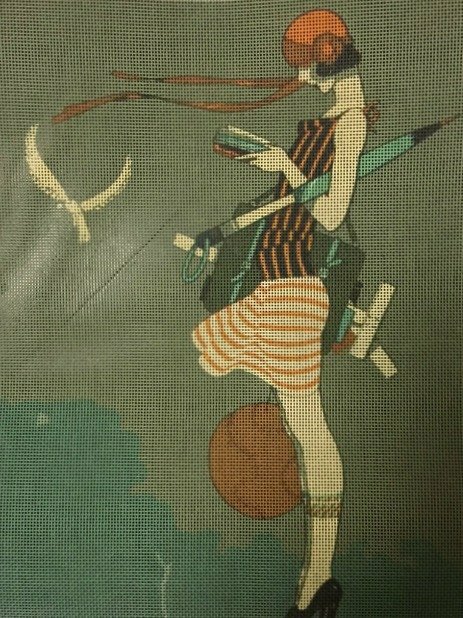 The design is color-printed onto 14 mesh needlepoint canvas. The design area measures 11" x 14". This Roaring Forties fashion needlepoint design is adapted from a 1920s poster. It can be purchased canvas-only or with cotton or silk. For cotton we use DMC cotton floss and for silk we use Planet Earth silks which are single ply for 14 mesh, easy to stitch with and have a gorgeous luster. If you wish to use stretcher bars to keep the canvas taut while you stitch then we recommend a pair of 15" and a pair of 18" for this canvas. Contact us with questions about any art needlepoint design.